All of a sudden it is September!! Still summer here in Spain and very hot but today I ordered wood for the burner and asked the chimney sweep to call! My chimney sweep is a lady from Germany who wears a traditional costume to climb up on the roof and the inside of the chimney to do an excellent job. Hopefully chimney sweeps are still lucky as I have just registered for the Skål International Congress in Mexico It gets more and more expensive each year so need a bit of luck for a lottery win or the 200 Club!! Our International Councillor Paul Follows is standing for Director which adds to the interest for the United Kingdom. 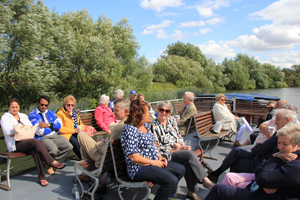 Oxford did a brilliant job with the tripartite trip on the river. I enjoyed the day immensely and worth the trip from here. Just off to do my Ice Challenge in the Village – we choose our own charities here – so Water Aid and Cancer Research will be the recipients. We were among the first to arrive at a gated and padlocked field, to find David and Anne from Southampton club waiting too. We were all hoping we had the right day and time. We were shortly joined by London President Paul Hoskins and a few more hopefuls queuing back on to the main road. Upon the arrival of the John Bright minibus we were asked if Fiasco Tours were organizing the event. 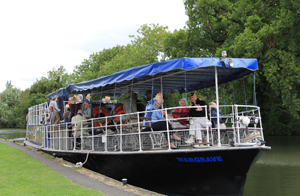 Although the weather had taken a downturn the boat was there, the catering wagon had turned up with the food and we were advised that the tea and coffee (or something stronger for those who wished/desired same) would be available shortly. With only a 15 minute late start waiting for those arriving by train, we set off to sail northbound: first to review the regatta and then viewing the sleeping spires of the City. 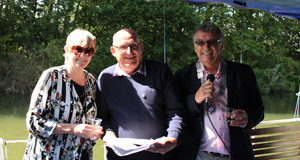 The cruise was fully booked with over 50 Skålleagues and guests and included Lyn and myself with partners from our Club. Southampton and Oxford well represented. 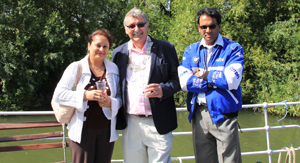 The prize for the most determined Skål member to join us goes to Beenai Ramjung from Mauritius and his wife (pictured with Ian) – who missed our departure but chased us first by taxi and then by boat to catch up with us at Sandford Lock. National President Alison arrived by a black cab and was at pains to tell us that the taxi was only from the station and First Great Western had performed well for once. Now are you sure that Fiasco Tours were not trying a takeover? Eventually the weather improved and many of us adjourned to the sun deck and appreciated the well chilled wine and beer. We had a most enjoyable afternoon and did not get back until 4pm. Credit to Ian and Karen Hawkes for a well organised day (how Ian managed to turn the weather- who knows). Twenty one of us enjoyed the hospitality of Val and Robin in their lovely garden on Sunday 13th July, reports Graham Appleby. Skålleagues, their partners and friends, Were lucky enough to have the pleasure of sitting in that beautiful, peaceful garden in bright, hot sunshine or seeking the shade of the orchard. As ever the food and drink, prepared and served with the help of Val’s daughter Lena, was excellent and abundant and it was nice to relax in familiar company. We were all pleased to see Sally there looking quite well. Eric Etienne once again came all the way from France for the day. President Valerie is holding her Presidents Night on Saturday 18th October at Cooden Beach Hotel. Please refer to last month’s newsletter for all the information and booking details. As well as a special rate of ₤90 per twin/double and £45 single including breakfast for Saturday, if you wish to stay for Friday night as well the Skal special rate for Dinner/Bed/Breakfast is ₤134 per double/twin room (₤67 single) Book direct with the hotel 01424 842281 and quote Skål. Tony Milhofer is requesting help on the WTM stand at the annual and most important Travel Event of the year – November 3-6 2014. Please contact Tony on 01608 645 645 or email rts@rtstravel.com if you have a couple of hours to help. Tony can organise entrance passes if necessary. BOOK NOW - JUST 6 ROOMS LEFT! As those of you on the 200 Club list will already know, the UK Assembly will be held in Lincolnshire - at Marston near Grantham, just off the A1. Thanks to Paula Rowe (the new MD!!) at IOW Tours, we have a new venue and outstanding value for the two day event. Full details and a booking form can be downloaded from here - click the relevant links. Mexico is fast approaching and I am asking for raffle donations for the congress to help with the funds. Each year over the last few years payments to Skålleagues have been more than the additional funds raised in the year and so slowly the fund is gradually reducing. The fund has helped three UK Skalleagues in the last year when the need has arisen which the Trustees have very speedily dealt with their requests. The assistance has been much appreciated by the Skalleague and their families and to see what it has done to help them in their hour of need would prompt each member to do what they can to assist the fund in the future. You also never know when the fund may be required to assist you. Previous article	Skål UK Newsletter - August 2014 Next article	New Skål UK website launched!